Wild rabbit is a fine delicacy not very many people have the opportunity of trying. 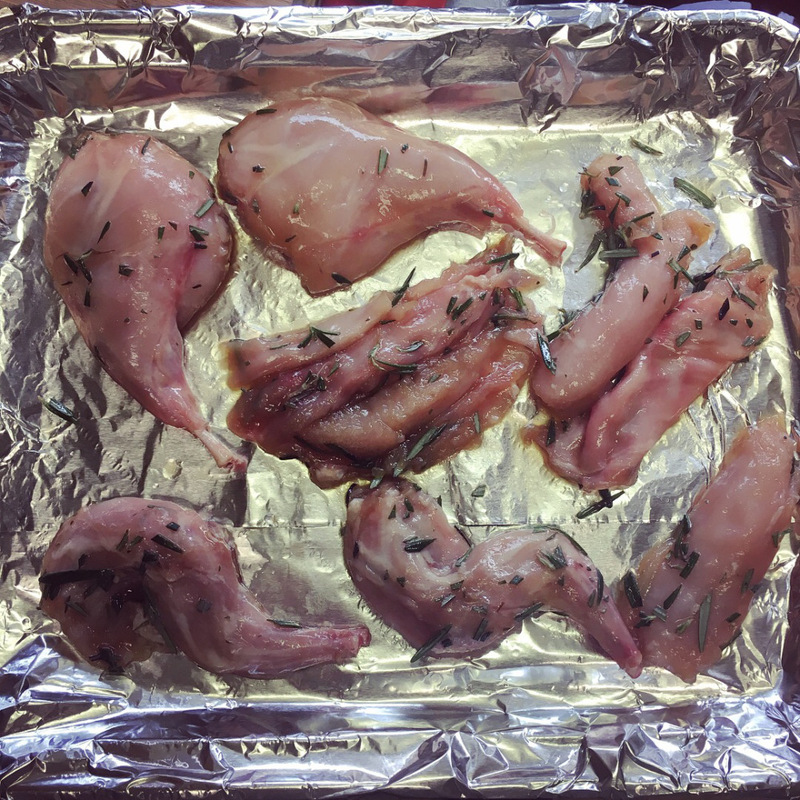 If you come across some wild rabbit in your near future (or perhaps have some already), this recipe will not disappoint! Not only is it simple, but it’s perfect for beginners! The honey and rosemary combination really gets your taste buds going! I LOVE ROSEMARY, I use it whenever possible, perhaps one of my most favorite herbs. The honey I used with this recipe is a local, homegrown honey, (literally, it came in a jar from an old man who had beehives in his backyard!) but you can use a store bought honey as well. The marinade must sit for 2 hours, so plan accordingly. If your rabbit comes whole, make sure to quarter it properly. I chose to remove all bones from the core prior to cooking, but you can cook with rib-on if you choose. It’s important to trim as much fat off the rabbit as possible, as well. NOTE: Rabbit has a very mild flavor, much like chicken. Because of this, it does have the tendency to dry out quickly, so be sure to baste your rabbit frequently. Prepare your marinade by mixing your honey, apple cider vinegar, minced rosemary and olive oil in a medium sized bowl. Connect with her on Facebook, Instagram, and her Blog!